Janeen Brian, my writing friend, will have a new picture book launched on the 9th of March. I asked her some questions about this new book and also about the writing process. As a writer, the writing process of someone else is endlessly fascinating. Questions for Janeen to go onto my blog Janeen, you have written many picture books before- including the classic 'Where does Thursday go?' What was different for you in this book Shirl and the Wollomby Show? For example was there anything new in the picture book genre that you discovered afresh? The formulation of the story was different because it began with a human character, not an animal as it turned out to be! (Someone once said I write a lot of stories with animals in them!) 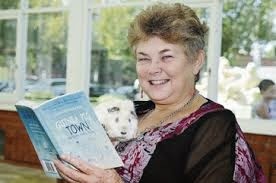 The initial character was based on a woman I’d seen at a local fair, selling her woollen works. I was also trying to pitch a story with an Aussie flavour because that’s what the publisher was looking for. So, the main difference I guess, was that to begin with I was coming at it from an external angle - that is, attempting to create a picture book with an Aussie theme. I’d done thematic commissions before for educational publishers, but not so with trade picture books. I was fairly loose with any ideas that presented themselves to me, so the story took many twists and turns along the way. What is it about picture book writing that draws you to it again and again? Although they are not always easy to write, I am compelled to write picture books because of the wonderful pictorial and poetic nature of the genre. I adore succinctness and the striving for that perfect word. Strangely enough, although I consider myself a visual person, I don’t have set-in-concrete images of the characters or setting. In fact they’re quite vague, like a washed-out dream, and I often see the action through the character’s eyes, which means it’s opportunity time for the illustrator! I love to create words, and play with words and you can do that in picture books. Like a poem too, your words can shoot straight to the emotions. 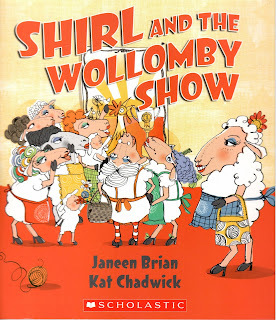 I think illustrators are amazing and Kat Chadwick in Shirl and the Wollomby Show has captured a paddock of sheep in a way I would never have dreamed of! They are absolute characters and I know she is keen to have another adventure with them. In this book you have written a rhyming text. Is this a difficult feat? Oh yes. With prose you can create a story and work on it draft after draft, but it’s the weird anomaly of rhyme that tests you! Rhyme is both constricting and surprising at the same time. However, if you’re open to ideas, sometimes a rhyming word can set you off on a different path altogether. It might sound formulaic, to get a word to rhyme and then create from that, but in fact it’s difficult at times. Everything has to follow on from that rhyme. It’s a challenge to write in rhyme and I think it was the writer Eleanor Nilsson, who said once that you should have your story idea first and then think of the rhyming pattern. While I think that is good advice, I also like to see where ideas go if they’re not hemmed in too tightly. The other challenge is that, whether it’s a stand-alone poem or a picture book, rhyming verse must have a particular rhythm. It goes hand-in-hand. The trouble is some words have too many or too few syllables and so the rhythmic pattern can soon become in disarray. So what do you do? You seek another word, or twist the sentence around, or work out a different solution altogether. Often as not, a particular word can be the undoing of many hours of work. Reminds me of dominoes. And it’s vital to read the work aloud, not once, but a hundred times! Even then, if you’re unlucky, you might still miss a rhythmic beat. I know there is a lot of humour in the book also and certainly humour in the illustrations as well. 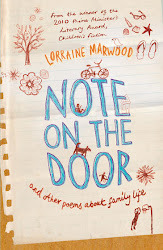 How important is humour for you in children's writing? I think it’s very important – depending on the tone of the book, of course. Children love to laugh. Listen to what children think of a major event, and they’ll regale you with one tiny incident that amused them! I don’t think it’s easy for some writers to write humour, and some do it better for one particular age group than another. Some writers are often the type of people who look for humour in their lives anyway and so that spills out into their writing, particularly if they can reach back into their childhood memories. I love to write humour into my work and I’m over the moon if it makes children laugh. Then I know I’ve struck gold. Do you think that the picture book market is expanding or shrinking in Australia? Over fifteen years ago I heard from every publisher and from those who’d been to major overseas fairs that the picture book market was dying. Paper was too expensive; four colour was too expensive, hard cover picture books are way too costly and so on. Publishers are still saying the same thing, but a few are looking at ways of reducing costs for the book buyer. It might be reducing the number of pages or lowering the cost of a paperback. But I believe picture books are the absolute key to children’s literacy, visual awareness and love of literature and to see that genre wither is just an inconceivable thought. Of course, there are already picture book stories online as well, and that’s fine, but that doesn’t involve the sensory book-reading/cuddling bonding that is so important for children. What gave you the idea for Shirl? Is there an evolving story behind the book? Shirl came about inadvertently. In the first few drafts of the story she wasn’t even there! In fact when she did creep into one aspect of the story, it was the publisher who said, ‘I rather like Shirl. What say you think about concentrating on her?’ Like I said before, dominoes! What I’d written up to then, crumbled in the face of that idea. But the comment sent thoughts wandering through my head. And so, after much brainstorming and re-thinking, Shirl eventually took centre stage. Is there anything in particular that you would like to highlight about this book? I think it’s a book simply to enjoy. It’s a good read-aloud story with humour and with great illustrations, and it says to us all, that whatever we come up against in life, we should just have a go and tackle it. You never know what could happen. And that’s a fairly strong Aussie attitude! Thanks Janeen for sharing the journey of 'Shirl and the Wollomby Show.' And also a wonderful surprise was the dedication! What a privilege and joy. I have a new collection of poems due out in August this year with Walker. Now this is where my note books come into their own- they put me back on our farm, back into unusual situations that only happen on a farm. I've been trawling some note books, amazed by the strength of some jottings- jottings that maybe when I wrote them I didn't realize their value- concrete details recreated for a non- farming sector. I wish I'd written more, more. But hang on- I had six young kids then, a farm, community commitments, a big garden to feed us, calves to feed, a husband to help and a long distance to travel to shops, services. But the funny thing, is I found time to write at the busiest time of my life. Every day, several poems, entries- now? Hmm, not so. But then nothing is wasted. The training I did then has stood me in good stead. This morning I have just written three poems based on specific memories and photos. A farm life makes one explore and value the surpring minute gems of life. It counterbalances the isolation, the loneliness. I'm into my second week of writing. I am switching between two writing projects- one for an older age group, one for a younger age group. I've become a bit side- tracked by notions that I need to plan- I do a little bit of background outlining- characters- I can see them- actually as I write they become clearer, I know them more-I don't think that for me that any amount of character profiles will help my novels. For example writing this morning working on the younger novel- I suddenly found a huge story problem that will flesh out my characters and the main aim of this book beautifully. It made me excited, yes! And its spinning something that happend to me into a new context. I think, I research, but nothing grows and shapes the story by just sitting and writing. Maybe one day this might change but for now, I write to find out what the story will be. My friend Caire Saxby has just had her latest picture book released and what a great catch it is. There is nothing as attention grabbing as reading a picture book to a child. It can bring stillness to a whole writhing mass of arms, legs and strident voices. And of course using a child's known language as a stepping stone from familiar territory to new reading delights, is a sure- fire way to engross a child. What sea- faring dishes does that old sailor enjoy? From the smallest dishes- krill to that impossible feat of a whole whopping whale. What fun! Illustrator Cassandra Allen uses the bollard- like structure of the old sailor with the stylised curls of wavy sea as a backdrop to swallowing the bright bollard colours of pink krill, blue jelly fish, orange fish and the humongous silver grey of a shark. Rollicking fun in rhythm, poetic language and pictures. Even the end papers are delight and the added bonus of a mini glossary of fishy facts makes many readings a joy. And children will demand repeat reading performances and also be tempted to interrupt with their own chorus of 'there was an old sailor ...' Highly recommended. There is a new addition of an art stand- (in the studio) so I've begun to put up signposts of my story. I am still in the evolving stage - I sort of know my characters- how do these different characters fit together- the setting, the time frame, the obstacles. These are all beginning to show themselves. There is nothing like writing to find out the answers to all these questions. I write for the surprise, the pleasure, when the frustration and the red herrings begin to not matter. Welcome Claire to my writing site- I know writers and readers are always keen to learn about that mysterious journey a manuscript takes to the finished celebration of a launch. Thanks for taking time to answer these questions. Your first picture book was about water- is the sea an important subject in your writing for children? I’d never thought of it like that, but yes water is very important to me. My dream is to one day live where I can see the sea from my desk. I spent a lot of time by or in the water as a child and I still love it. I don’t know whether that’s why it features in my books, or whether it’s because I have such a rich vein of memory to tap. Is rhythm and repetition an important part of your picture books writing especially in this book? Rhythm is very important in my writing, particularly of picture books. Repetition too. I read the drafts out loud, listening for the rhythm and the flow. For ‘There Was an Old Sailor’ there is also rhyme. The three ‘Rs’ here are the scaffolding on which the story hangs. I read at my local kinder to the four-year-old group and they respond very strongly to all three elements. The kinder motto is ‘Play is the work of childhood’ and sharing story with the children is part of the foundation for their literacy. Do you guide an illustrator in their interpretation of your text? No. I trust them to bring their own vision to the narrative. And they always do. Often beginning writers or even those with book published become discouraged with the wait on acceptance of a manuscript, do you have any advice to offer? I wish there was a magic formula to make waiting easier. Waiting is always hard, especially for manuscript responses. There are always stories about manuscripts being lost either in the mail, or in a pile, but mostly they are working their way through the process. In some circumstances, it can take more than a year. The best advice I can give is to forget about it! Not at all easy, but essential for developing patience. Work on another project. Gnash and wail and worry as little as you humanly can. And in case anyone is wondering…it doesn’t really get any easier. I know that you write across genres, especially poetry, non fiction and chapter books, do you have any preference for a genre? Not really. I love creating story, and playing with words and language. The form that a story takes is not always something that I decide consciously. Some stories lend themselves to a longer form, others to a very short form. Some, like ‘There Was an Old Sailor’, develop from an already constructed ‘shape’, by modeling from an existing story. I like trying different things and will sometimes set out to work in a very different way, just to see what might happen. Publicity for any new book is always a challenge; have you any sure and tried ideas which have helped over the number of book launches you have put together? I enjoy launching a book for a number of reasons. The first is to share my book with the world. The second is to say thank you and to celebrate with those people who have been part of the writing journey. Family, friends, colleagues. As for sure and tried ideas…choose a venue big enough for the invited guests but also allow for passersby to feel they can stop and see what’s happening. Keep it simple. Don’t talk too long J. ‘Success’ in promotion is very difficult to measure. It’s almost impossible to know which promotional seeds planted will produce results. I enter every promotional activity prepared for anything! Important: be flexible! What motivates your writing? I know this is a hard one- but do you wait to be inspired or do you establish a writing routine? Ooh, yes. A very hard one. Probably a mix of both. I try to write every day, even if inspiration seems elusive. I’m usually working on more than one project at a time, so can focus on different parts of the writing process depending on what the world around me is doing. Eg I don’t try to develop a new plot if my children are in and out asking me questions, it’s too hard to keep the plot balls in the air. On days like that, I’ll do things that don’t suffer if I’m interrupted. Ideas do clamour for attention though and I try to capture the essence of the idea as it occurs. Then I leave the development of the idea until there is time to work without interruption. Deadlines are a wonderful motivator though, and I do like having them. Do you put a hook on the end of each age spread so that your reader is compelled to turn the page to finds out what happens next? Not consciously. I concentrate mostly on shaping the story. Often page break decisions are made by others. In chapter books, I do try to finish chapters in a way that encourages readers to start the next one. When you write picture books do you use poetic images or write simply? Or use humour? My first draft is about getting a rough story arc and I don’t spend a lot of time on the language. But subsequent drafts, when I’m happy with the shape, are all about getting the images right. The simplest images are often the most difficult to craft well. Claire thanks so much for sharing- its great to have you here on your blog tour and I’m positive that readers everywhere will thoroughly enjoy ‘There was an old Sailor’. I am taking a workshop for poets at the SA writers Centre on 20th February. I really love teaching and sharing. The techniques I will share will be what works for me the poet- how to increase my creativity and output.